Heineken set-up Irish and English rugby supporters during Ireland v England 6 Nations clash. The lads at Heineken were at it again with another unique pub stunt and this time it was Irish and English rugby fans that found themselves in a very unique yet hilarious situation. 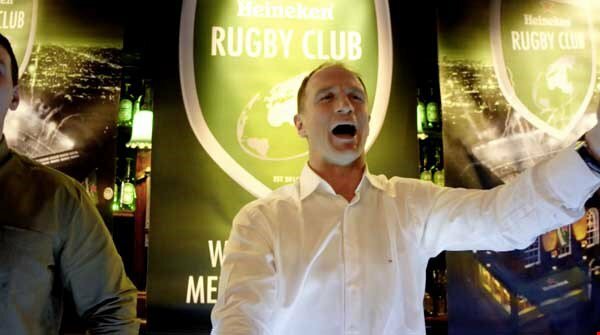 With the help of rugby legends Denis Leamy and Mike Catt, HEINEKEN took over a busy pub in Dublin and during the game they brought the day to a complete halt by switching off the TV and shutting down the beer taps, much to the surprise and disgust of the large group of fans present. The reason for the sudden halt in festivities was to bring rival fans together to see if they could work together to achieve a common goal…get the beer flowing again. Rugby fans the world over are known for their singing but what would happen if rival fans had to sing together in order to get their glasses refilled? Neither ‘Molly Malone’ nor ‘Swing Low Sweet Chariot’ could solve the problem that lay before the thirsty crowd, in fact it was a Welshman who saved the day as both sides united in a rapturous rendition of Tom Jones ‘Delilah’. The stunt was created to launch Heineken Rugby Club, a place which inspires and enables rugby supporters to use the game as an opportunity to open their world. Heineken Rugby Club brings fans together in celebrating and sharing the unique sociability that rugby, and rugby supporters, display. Heineken Rugby Club – where rugby meets the world. Join us at www.HeinekenRugbyClub.com now.